Justin O’Halloran’s charges are hoping to claim a maiden championship victory at Gaelic Park against Sligo on Sunday. 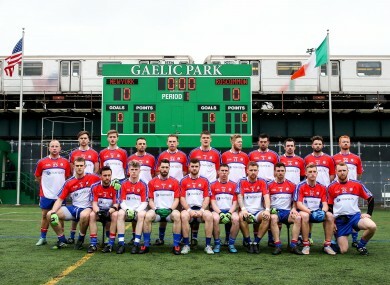 The New York panel ahead of last year's one-point defeat to Roscommon. NEW YORK MANAGER Justin O’Halloran has called on the GAA to give his side the same second chance afforded every other inter-county team in the All-Ireland football championship. The Cavan native’s charges came mightily close to taking their first Connacht championship scalp last year and they’ve been stewing on that one-point defeat to Roscommon for 12 months, something O’Halloran describes as “unfair”. Last year’s result against a then-Division 1 side didn’t just catch the Rossies by surprise, it stunned the entire Gaelic football community. O’Halloran believes the squad he has available this year — which has been bolstered by the addition of former Mayo senior footballer Tom Cunniffe and ex-Dublin All-Star hurler Danny Sutcliffe — is at least on a par with last year’s panel. Those words will no doubt concern Sligo ahead of Sunday’s Connacht SFC preliminary round (8.15pm Irish time) tie at Gaelic Park after a middling season in Division 3 which produced three wins, three losses and a draw. Between 2011 and 2015 New York lost their five championship games — playing each Connacht county once — by an average of almost 21 points but the bookies have shortened the Empire State into 11/4 to claim a maiden championship victory this weekend. O’Halloran believes his side have turned a corner and the GAA should recognise that by allowing them into the qualifiers. “One thing I would like is if New York got into a back-door situation,” O’Halloran said on a conference call from the Big Apple yesterday. “I think it is unfair that London can get into one and New York can’t. Possibly that reason was because New York haven’t been competitive for years, but I feel now that the team is getting better every year that should be thought about. But that’s not up to me, it’s up to the hierarchy. While the lack of visas may have been an issue for some New York representatives in the past, O’Halloran doesn’t believe that would be an obstacle for his team were they invited to compete in the qualifiers in Ireland. “I think we are lucky enough, 90-95% of our squad now are able to travel. A positive O’Halloran feels two challenge matches against Donegal in New York last month — which they lost 1-5 to 1-12 and 0-12 to 1-17 — has them sharp for Sunday’s clash against Niall Carew’s side, with a Connacht quarter-final against Mayo awaiting the victors. “They were very beneficial. We got up to speed,” O’Halloran says of the Donegal fixtures. “I thought Donegal played pretty much at championship level. The annual loss of key players is a constant juggling act for New York but with nine of last year’s starting XV included in this year’s panel, there is a greater sense of continuity. Midfielders Brian Connor and Luke Loughlin are unavailable with ACL injuries, but with the likes of Sutcliffe, Cunniffe, former Kerry U21 David Culhane and ex-Wicklow senior Conor McGraynor involved this year, spirits are high in the New York camp. “We lost some good players and gained some good ones. The preparations have been very good. We trained very hard. We’ve been lucky weather wise. We didn’t get too much snow, too much cold. The boys are all ready to go, so we are in fair good shape now. “They are getting on good, they are training away,” adds O’Halloran of Sutcliffe and Cunniffe. “They are looking good in training anyway. O’Halloran is careful with his words but it is clear he is heading into this weekend’s tie full of confidence, and he believes a New York championship victory is on the horizon in the next few years. “Obviously it’s going to happen at some stage. Hopefully, the sooner the better for us now. We are going on the right track to make it happen. It’s all going to be down to the day when the boys step across that line. Email “'I think it's unfair London get in and we can't': New York boss calls for qualifier route”. Feedback on “'I think it's unfair London get in and we can't': New York boss calls for qualifier route”.